… for your fab and funny comments on the last post. I learned a lot, too. Who knew there were microchipped cat flaps that only let in the right cat? I think the cat must have sensed all the adoration coming its way as he’s been extra aloof this week. 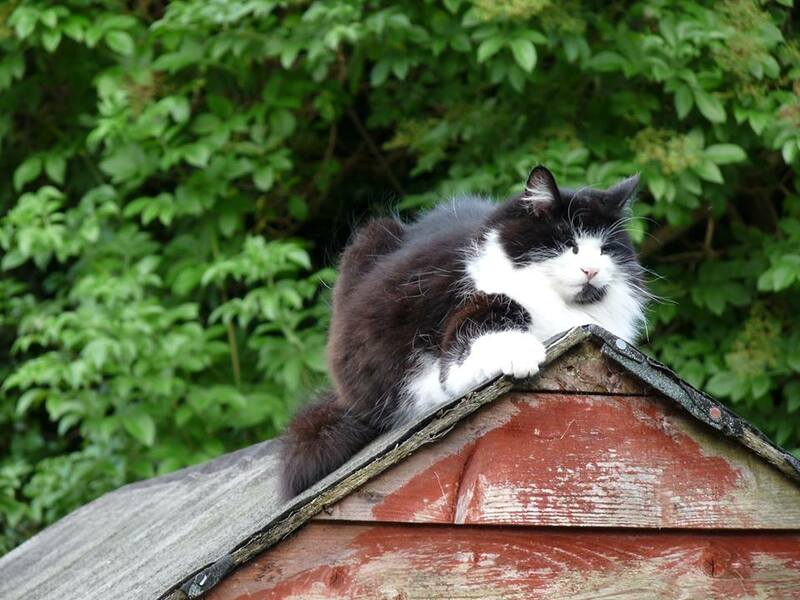 No interest in affection; too busy trying to catch insects and snoozing on the shed roof. Neglected to comment on the last post, but it was seriously one of the best things I have ever read in blogland. And, great photos. That’s a cat for you. It’s all ‘like me, love me, hold me, meow…..me me me with youuuuu! ‘ . Then , you give em a little love and it’s all nose and tail in the air ‘ who the heck are you ‘. You nailed it! The little rotters! I saw this article yesterday and thought of you guys and Donut. The last section is the part that was enlightening. Wow Julie! Those little rotters get around.